Selection of cured meats, sun-blushed tomatoes, mozzarella & garlic ciabatta. Homemade chilli mince & tortilla chips, topped with mozzarella & sour cream. Four slices of ciabatta smothered in garlic butter, topped with mozzarella & our homemade basil oil. Four slices of ciabatta smothered in garlic butter. Ask your server for today’s toppings. Marinated in lemon olive oil. Selection of fresh breads with balsamic & rolls. Farmhouse Paté served with sweet red onion chutney & doorstop toast. Deep fried until crispy & golden, served with our homemade tartar sauce. Prawn & crayfish salad, tossed in a marié rose sauce. Five king prawns wrapped in filo pastry, served with a sweet chilli dip. Beef tomato wedged between two slices of black pudding, served with a wholegrain mustard sauce & crispy pancetta. Four breaded chicken strips served with a garlic mayo dip. Flat field mushrooms roasted in garlic butter and topped with bacon & mozzarella. Fillet of Smoked Trout served with a salad garnish. Braised in our homemade bbq sauce – Be prepared to get messy!!! Fresh tomatoes, red onion & basil on garlic ciabatta, topped with mozzarella cheese. Chunks of cod with spinach in a creamy curry sauce, served with naan bread. Sauté mushrooms in a cheddar sauce served with garlic bread. Each of our children’s meals is served with a complimentary Fruit Shoot drink and served with chips plus a choice of either garden peas, baked beans or a small salad. Beef steak & lambs kidney, served with a side of gravy – If you haven’t tried one, you don’t know what you’re missing! No more bowl and puff pastry lid, we offer a proper homemade pub short-crust pastry case with your choice of fillings, served with chips or mash potato, & buttered greens. Chicken, bacon & leek, served with a velouté sauce – If you haven’t tried one, you don’t know what you’re missing! No more bowl and puff pastry lid, we offer a proper homemade pub short-crust pastry case with your choice of fillings, served with chips or mash potato, & buttered greens. Traditional cheddar cheese & red onion with a dash of English mustard, served with a cheddar & spinach sauce – No more bowl and puff pastry lid, we offer a proper homemade pub short-crust pastry case with your choice of fillings, served with chips or mash potato, & buttered greens. Beef steak, sauté mushrooms & red wine, served with a side of gravy – If you haven’t tried one, you don’t know what you’re missing! No more bowl and puff pastry lid, we offer a proper homemade pub short-crust pastry case with your choice of fillings, served with chips or mash potato, & buttered greens. Minted lamb, rosemary & pea pie, served with a minted gravy – If you haven’t tried one, you don’t know what you’re missing! No more bowl and puff pastry lid, a proper homemade pub short-crust pastry case with your choice of fillings, served with chips or mash potato, & buttered greens. 8oz homemade burger topped with fried onions. Served with homemade double-cooked chips & ‘Ryles Slaw’. This big boy has the additional extras of cheddar cheese, bacon and topped with an egg. Served with homemade double-cooked chips & ‘Ryles Slaw’. Flame grilled chicken breast served with our mayo burger relish. Served with homemade double-cooked chips & ‘Ryles Slaw’. Choice of a beef or chicken burger topped with blue cheese & bacon. Served with homemade double-cooked chips & ‘Ryles Slaw’. 8oz rump steak cut into strips with fried onions, green peppers and lashed with our cheddar cream cheese sauce. Served with homemade double-cooked chips & ‘Ryles Slaw’. A Mozambique creamy peri-peri sauce – Our speciality chicken dish with a mouth-watering topping, served with chips, rice, or half-and-half! BBQ hickory sauce, topped with bacon & melted mozzarella cheese – Our speciality chicken dish with a mouth-watering topping, served with chips, rice, or half-and-half! Creamy Tandoori sauce topped with a fresh coriander salsa – Our speciality chicken dish with a mouth-watering topping, served with chips, rice, or half-and-half! Classic spicy Szechuan sauce with onions, peppers and tomato – Our speciality chicken dish with a mouth-watering topping, served with chips, rice, or half-and-half! A coconut milk, red Thai sauce with red peppers, spring onions & served with a fresh coriander salsa – Our speciality chicken dish with a mouth-watering topping, served with chips, rice, or half-and-half! Topped with our creamy stilton sauce and grilled bacon – Our speciality chicken dish with a mouth-watering topping, served with chips, rice, or half-and-half! Lashings of garlic in our creamy mushroom sauce – Our speciality chicken dish with a mouth-watering topping, served with chips, rice, or half-and-half! An olive oil based sauce with chilli, garlic & peppers – Our speciality chicken dish with a mouth-watering topping, served with chips, rice, or half-and-half! Fillet is the leanest and most tender cut as it’s the laziest muscle on the cow; a real ‘melt in the mouth’ steak. Served with grilled cherry vine tomatoes, beer-battered onion rings and your choice of either chips or jacket potato. Sirloins have an excellent balance of flavour and tenderness and sit just above the fillet, so best served medium rare. Served with grilled cherry vine tomatoes, beer-battered onion rings and your choice of either chips or jacket potato. Rump steaks are often considered the best for flavour and as such are very versatile. They are slightly less tender with more texture than a sirloin, but are usually a little cheaper. Served with grilled cherry vine tomatoes, beer-battered onion rings and your choice of either chips or jacket potato. A large steak for steak lovers, taken from the whole sirloin. On one side of the T-bone is a piece of lean fillet; on the other is a classic sirloin steak. Served with grilled cherry vine tomatoes, beer-battered onion rings and your choice of either chips or jacket potato. Rich marbling and traditionally matured, ribeyes have plenty of fat running through, helping maintain extra juiciness. It also helps keep the steak tender if cooked for longer, perfect for those who prefer their steak cooked a bit longer. Served with grilled cherry vine tomatoes, beer-battered onion rings and your choice of chips or jacket potato. 6oz steak, lamb chop, 6oz gammon, two sausages, grilled liver, two slices of black pudding, egg, tomato & onion rings. Oh, and we forgot to mention the chips. Rump steak stuffed with onions, mushrooms & cheddar cheese. Served with grilled cherry vine tomatoes, beer-battered onion rings and your choice of either chips or jacket potato. BLEU: Seared and served – RARE: Completely pink and fleshy. Very, very tasty! – MEDIUM RARE: A little less rare, still very juicy – MEDIUM: Pink in the middle – MEDIUM WELL: Slight hint of pink but mostly grey in colour – WELL DONE: Grey, tough, chewy, flavourless, dry. Add 7 pieces of scampi to your dish! Add a 300g rack of bbq ribs to your dish. A dish for two, containing three seasonal vegetables. Sauté baby spinach & onion in a creamy white sauce. Fresh garden salad served in a mini colander. Onions, carrot and, just to be different, red cabbage. Grilled butterflied chicken breast topped with bacon and a creamy stilton cheese sauce – All main courses are served with your choice of Chips, Mash Potato or Jacket Potato. A recipe from a restaurant owner in the Eastern Cape. Grilled chicken breast topped with fresh tomatoes, sweet red onion, garlic and basil, and finished with melted mozzarella – All main courses are served with your choice of Chips, Mash Potato or Jacket Potato. Leg of lamb steak served on black pudding and dressed with a rosemary and red current sauce – All main courses are served with your choice of Chips, Mash Potato or Jacket Potato. Leg of lamb steak grilled to your liking and topped with our minted sauce – All main courses are served with your choice of Chips, Mash Potato or Jacket Potato. Three Succulent lamb chops grilled to your liking and served with greens – All main courses are served with your choice of Chips, Mash Potato or Jacket Potato. Pork loin towered with black pudding, topped with crispy pancetta and served with a wholegrain mustard sauce – All main courses are served with your choice of Chips, Mash Potato or Jacket Potato. Pork loins topped with grilled apple & melted stilton cheese – All main courses are served with your choice of Chips, Mash Potato or Jacket Potato. Thick-cut gammon served with fresh pineapple, or free-range eggs, & peas – All main courses are served with your choice of Chips, Mash Potato or Jacket Potato. In a rich red wine onion gravy with bacon and served on a bed of mash, with greens. Jalepeno peppers, kidney beans & black eyed beans – Should help clear any cold! 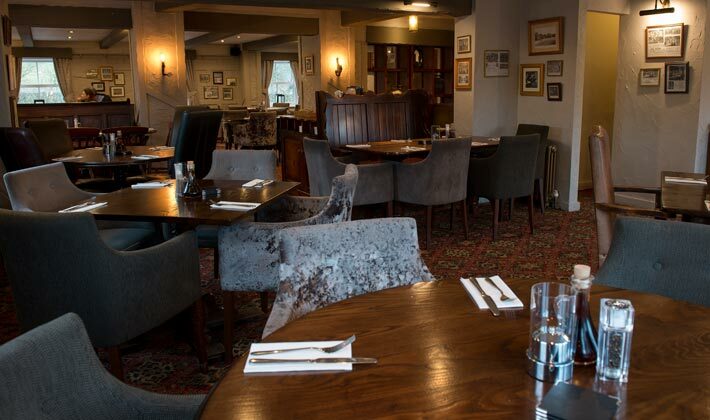 – All main courses are served with your choice of Chips, Mash Potato or Jacket Potato. Pan-fried strips of rump steak with mixed peppers & onions in a creamy paprika sauce. Best served with half chips, half rice. This dish is getting as famous as our steaks! A whale-of-a-dish in it’s own right, served with mushy peas or garden peas. Fillets of cod, pan-fried and topped with a spinach & cheddar cheese sauce. Poached salmon steak served with crushed new potatoes mixed with sauté spinach dressed with hollandaise sauce. Layers of pasta mixed with spinach, red peppers, courgettes, aubergines & mushrooms. Pan-fried mushrooms and mixed peppers in a creamy garlic paprika sauce. Please ask your hostess for today’s details. If we impress you, please tell others, if we don’t, please tell us! All prices include V.A.T. We operate a strict policy of one bill per table. A special feature of the Ryles Arms’ accommodation is our unique Dine & Stay deal. For £130 per couple, you‘ll be treated to a three course meal from the menu or specials board (Tthis includes our fillet steaks), a nights stay in our luxury barn conversion and, to top it off, a full English breakfast in the morning. All that’s left to pay for are your drinks! It’s great for spoiling your loved one or, as part of a group, having a night out without the hassles of mini-cab costs or designated drivers. You can also purchase as a voucher. For Dine & Stay in the Superior Room, there is an additional charge of £30.00.